Nestled on the fringe of Raglan, surrounded by native bush and featuring harbour views, this house is an ideal getaway for those wanting something away from the hustle and bustle of cities. Peacefully located within a native bush, this place is perfect to relax and unwind. Modern architectural designed, and North facing Bach, this house is situated on two levels. The upper level features a kitchen, dining, and lounge area, with floor to ceiling windows on walls looking out onto the deck. The private upper deck, shielded from neighbours, overlooks a bush area and inner harbour, with views over the water. Upper Deck features outdoor seating as well as a barbeque. The bottom level houses the bedrooms, all featuring sliding doors onto the private lower deck nestled into the bush itself. The house is a 5 minute walk to safe harbour swimming at Cox or Lorenzen Bays as well as a 20 stroll to Raglan cafes and speciality shops. 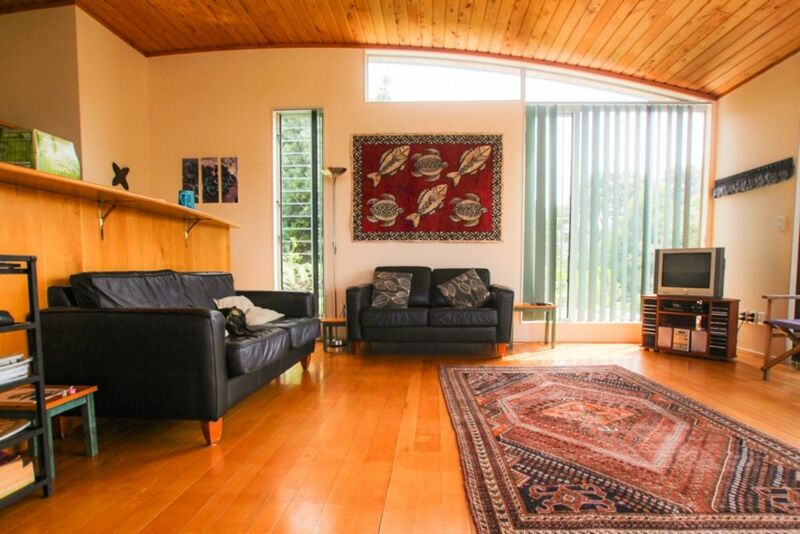 If surfing is what you are after, the house is a 15 minute drive to the famous Raglan surf beaches. Pets are welcome after negotiation. Well equipped modern and clean home. Lovely spot - we’d love to come back. Lovely escape to Raglan in a experiment of taking our small dogs and enjoying a lovely house. Thanks Anna for allowing us to share your house, the joys of Raglan with pets included. We have 2 house trained little dogs that love company so unsure how they would settle but did. Great house as like ours with 2 levels and upper deck has views of bush and harbour so contained. Wanted a relaxing stay, no car needed (brought own food) and enjoy local Coxs beach (2 mins walk and wait for high tide) with walks. We wanted relaxing, read book and enjoy peace. Would stay again. Good communications with Anna. Lovely. Nice and relaxing, great views! Lovely location, very relaxing stay! Loved staying here. Such a nice setting. Was able to fully relax! As a family we spent 2 days over Christmas at Bayview Crest. Quiet, large well appointed living space, great view.